This page is for the original game. 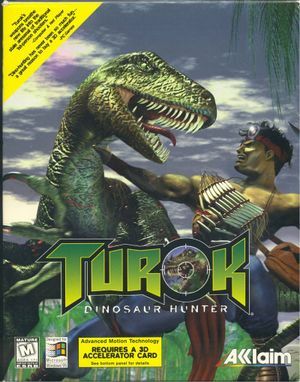 For the 2008 game, see Turok. For the 2015 remaster, see Turok: Dinosaur Hunter (2015). Launch with -MaxFramerate 62 parameter. The game can use either Direct3D or Glide. The Direct3D renderer provides more options and is the one necessary to use the patch for higher resolutions and widescreen support. Before applying the patch, make a backup of the Turok.exe and Video_D3D.dll files in case the modifications go wrong. Download turokfix.exe and run it. Replace 800 and 600 in the fields with the resolution you want to use (note that for a high resolution, such as 2560x1440, you may need to use dgVoodoo 2. If you have nGlide or other GPU emulators installed: make sure you remove the Video_3DFx.dll, Video_PowerVR.dll and Video_RagePro.dll files from your Turok installation, otherwise the game might try to use another renderer instead of the Direct3D one. This page was last edited on 14 April 2019, at 12:42.